The Goliath variety of tomato plant is an heirloom variety. Heirloom vegetable plants are plants that are passed down through generations. They have a desirable characteristic such as size or exceptional taste. The Goliath tomato is an example of a great-tasting tomato, but it is known for its ability to produce tomatoes that weigh up to 3 pounds. There are some improved varieties of the Goliath tomato, such as a small growing, patio or bush variety, that are now available. The Goliath Tomato Bush variety produces well under the same growing conditions as other heirloom tomato varieties. Locate a place in the garden to plant the Goliath Tomato Bush plants in full sun, which means at least six hours of unobstructed sunlight daily. The more sunlight the plants receive, the better the tomato production and the stronger the plants. Clear the area of weeds and expect to plant the tomato plants 36 inches apart for good air circulation. Pulverize the soil to a depth of 12 inches. Add a 1-inch layer of compost and the recommended amount of granulated organic fertilizer, according to the container label, to the soil surface. Use a rake or hoe to work the amendments into the top 3 inches of soil. Rake the area smooth when finished. Plant the Goliath tomato bush plants with up to 80 percent of their stems buried to create sturdy plants with good root systems. Pull off any leaves that will be below the ground level. Cover the roots and stems with the soil, compost and fertilizer mixture. Add water to the planting mixture to make sure the roots are covered well and there are no air pockets around the roots of the plants. Add tomato cages or other support around the new plants because the fruit of a Goliath tomato plant becomes large and heavy, causing the plants to fall over in high winds. If planting in a protected location, bush type tomato plants do not need support. Water deeply every seven to ten days. 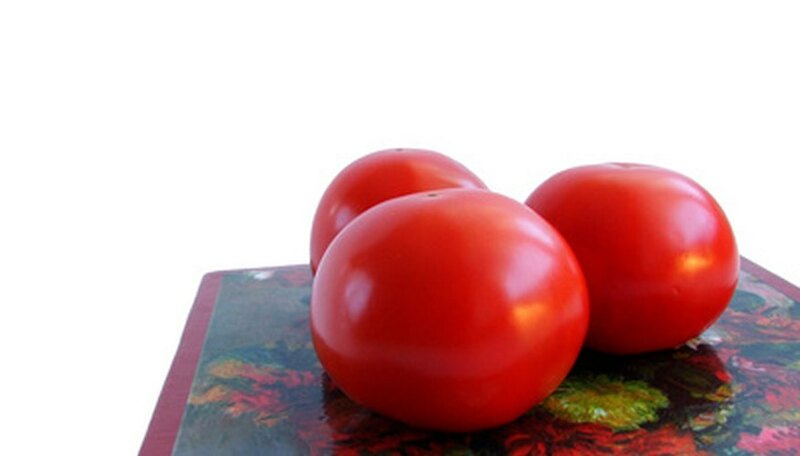 It is better to deep-soak the tomato plants occasionally rather than to water lightly several times a week. This is so the plants can develop deep root systems.